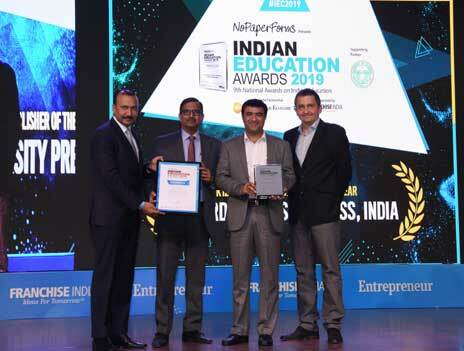 New Delhi: Oxford University Press (OUP), the world’s largest university press, won the “Best K-12 Publisher of the Year” award at the 9th Indian Education Awards 2019 for its exemplary work in the School education sector. The award was conferred by the Indian Education Congress on 12th February, 2019, in the presence of Mr. Suresh Prabhu, Hon’ble Minister of Commerce and Industry and Civil Aviation, Government of India. Yash Mehta, Executive Director – School Education received the award on behalf of Oxford University Press. The award is a testament to OUP’s growing presence in the School, Higher Education, Academic and Professional learning segments, where it’s print, digital and integrated offerings continue to lead the market. Presently, OUP India directly engages with over 25,000 schools across the country, several hundred professional and higher education institutions and nearly 10 Mn teachers year on year, to ensure widest reach for its world-leading learning solutions. The jury considered OUP’s pedagogically advanced learning resources, including textbooks, children’s books, dictionaries, atlases, assessment and integrated learning solutions for schools.